Easter time traditions and symbols are steeped in history. Since ancient times, people have celebrated the return of Spring and the rebirth of life. Romans and Egyptians exchanged painted eggs to symbolise the end of harsh, winter months. From the 15th Century onwards, Christians put their eggs to one side during Lent. They were decorated and offered as gifts at Easter to commemorate the ressurection of Christ. It was in the 17th Century that a new trend arrived and fresh, consumable eggs took a back seat. Instead, courtiers began to exchange ornately decorated eggs, made from precious materials that sometimes concealed a gift. It took until the 18th Century for chocolate makers to hit the scene; they emptied the eggs, filling them with chocolate and, within a few decades, the production of 100% chocolate varieties began. 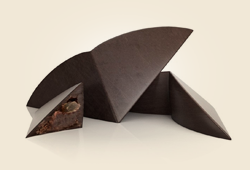 With easily sourced cacao and the introduction of moulds, this pleasureable novelty flourished and continues up until today. The tradition of the Easter hare originated in Germany with the 'Osterhase', which was subsequently adopted by America, where the 'Easter Bunny' has since become the best known rabbit of them all. This imaginary creature symbolises Spring and fertility; it's up to him to prepare and distribute chocolate eggs to all the kids. Even if slight differences exist within Easter traditions, everyone agrees that to hide, seek, find, offer and eat Easter eggs is a pleasure in itself! We're therefore delighted to have a delicious selection of Easter eggs on offer. 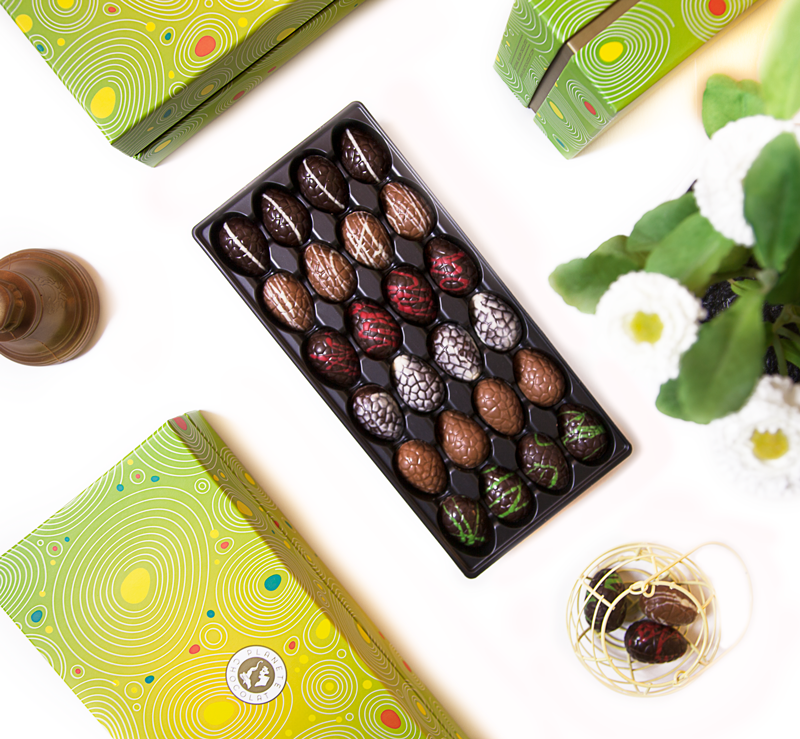 You can fill up a gift box with eggs of your choice, to offer to close ones; the genuine article that contains hand-made Belgian chocolate eggs that are top quality and made from 100% cacao butter. There's a wide choice; a 'little treat' (250g), 'a pleasure' (500g) and a 'gourmand' (1kg), with chocolates that include: crunchy praline with Grand Marnier or honey, lily of the valley ganache with truffles, Earl Grey and mocha with butterscotch or orange and a praline fondant...to name just a few on the list. 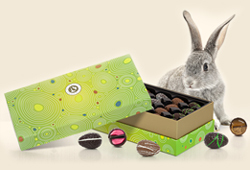 Our delicious range is presented in elegant packaging, designed to please the eye as much as lifting the spirit: a beuatifully spring colored box with 24 kleine handmade eggs, a surprise egg with a wonderful ribbon; a box filled with treats for children; eggs with the flavor of seafood and a nicely arranged Easter basket. And inside is a selection of our traditionally made eggs - milky marzipan, white raspberries, vanilla cream fondant, white chocolate praline, fondant honey praline, crispy hazlenut, white chocolate with caramel and orange, creamy gianduja and so forth. Treat little ones to an adorable 'Easter Bunny' soft toy that contains its own little surprise - 4 eggs made from sugar, praline and caramel, milk chocolate praline and white chocolate with caramel orange. Or you can try out our spring-motif lollipop dippers - you'll find eggs on a ganache stick that you swirl and melt in hot milk to make a divine, velvety drink. Finding it hard to choose? If so, go for our special Easter basket: a 200g box of chocolates, a bunny key ring with its little packet of eggs, a springtime mug and a photo frame, decorated with its own 'Easter Bunny'.